We are so excited to have you here for a super fun and inspiring challenge. This week it's all about getting to know you just a little bit better as we're asking you to draw inspiration from yourself. We can't wait to check out your blogs! Have you seen our big orange announcement banner at the top of the blog? We're just counting down the days until we can share. Ok, here it is...It's been nearly 9 months in the making. There is also a hint or two on our brand new Twitter page! That's right, we are now on Twitter! We are thrilled to present our sponsor this week who are providing an amazing prize giveaway to this week's winner!! Established in 2001, A Muse Studio is a boutique-style paper crafts company that creates flexible, work-from-home business opportunities for women. Our exclusive products are sold at fun, in-home workshops, and online through a network of independent Creative Consultants throughout the United States. Innovative products and trend-setting style set us apart from other paper crafting and social selling companies. A Muse Studio's head office is located in Seattle, WA. Best of Times cling set, latte pearl stickers, A Muse Studio Grass ink pad and a 20-pack of their yummy fall palette cardstock. Valued at over $35!! Coolest idea for a challenge EVER! This is such a cool challenge! Love all the amazing projects by the DT! Fabulous cards, ladies! What a grand idea, I can't wait to play! I'm so honored to have designed a few of the blog headers with the visions of each designer behind them, and to see fabulous cards inspired by the headers almost brings a tear to my eye. 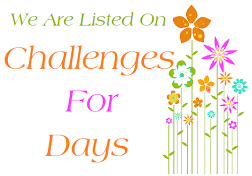 Such a wonderful challenge idea and I love the DT's takes on their blog headers! Can't wait to play! Wow, what a great idea - I love this challenge and checking out the matching cards and blogs! What a fun, fun challenge. So original! And it is so much fun to check out others' header and how they used it for inspiration. super fun challenge ladies....fabulous inspiration! What a cool challenge. So fun to see what everyone has come up with. Fabulous idea! I like it and decided to play along too. just submitted my entry, great inspiration from DTs and fellow participants. loved seeing their blog s.
Such a FUN Challenge....LOVE all of your cards!! Unfortunately I wasn't able to play along the week this was posted but knew I wanted to do the challenge when I had the time. I thought it was such a fun and unique one!